7-Eleven presents "Asset Protection Award of Excellence"
7-Eleven had the opportunity to recognize a vendor partner that has been critical to the success of our store camera system enhancements. Between 2012 and 2013, a 7,000 plus store rollout of the ClickIt digital video recording system was completed along with recent integration of our older technology. TYCO provided the integration and also installed and supports our store panic alarm systems. Brad Chase with TYCO was presented with the “Asset Protection Award of Excellence” for his “outstanding support and extraordinary contribution”. Mark Stinde presented Brad Chase with the award and commented that the success of the program had involved many, but 7-Eleven wanted to recognize Brad for his above and beyond efforts. 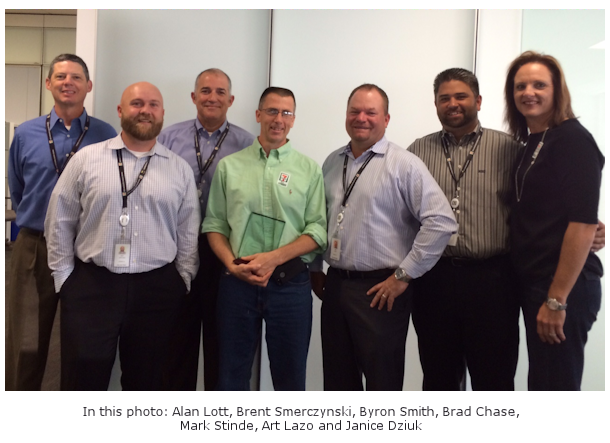 Those present from 7-Eleven were Art Lazo, Brent Smerczynski, Alan Lott, Byron Smith and Janice Dziuk from TYCO. Congratulations to Brad and the TYCO Team!